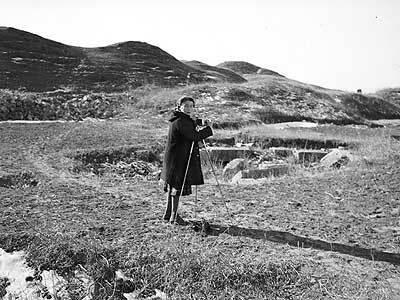 Hedda Hammer with camera and tripod near the Western Hills, Beiping (Peking), early 1940s. Photograph reproduced courtesy of Alastair Morrison. Photographs of China constitute a rich resource for historical research and a source of inspiration for contemporary artists, writers and designers. Hedda Hammer Morrison (1908-1991) took thousands of photographs to document Peking/Beiping, the old imperial capital, and the lives of its people, during a thirteen-year period of residence from 1933 to 1946. Born in Stuttgart in 1908, Hedda studied photography at the Bavarian State Institute for Photography in Munich and in 1933 left Germany, which was coming increasingly under Nazi control. She secured a job in Peking as manager of Hartung's Photo Shop, a commercial studio with a well-established clientele of diplomats and resident foreigners. After her contract there expired she continued to work as a freelance photographer. In 1946, Hedda married Alastair Morrison (b.1915), the son of Dr George Ernest Morrison (1862-1920), Peking correspondent for The Times of London and later political advisor to Yuan Shikai, the first president of the Chinese Republic. G.E. Morrison was himself an enthusiastic photographer and his photographs have recently been published (see Shen Jiawei, ed., Old China through G E Morrison's eyes, Fuzhou: Fujian Jiaoyu Chubanshe, 2005, 3 vols). Writing in 1992 Alastair remembers Hedda, 'Ranging around the great city on her bicycle, always with her Rolleiflex camera strung around her neck, she never lacked subjects to photograph. Apart from a wide range of architectural studies she was especially interested in crafts and the everyday activities of people'. 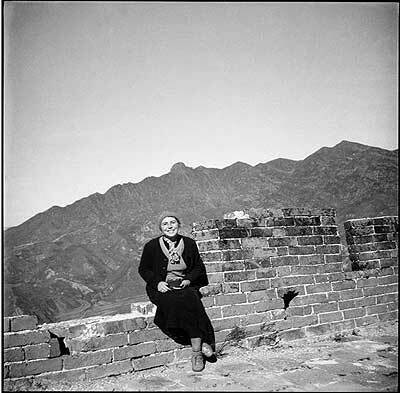 Hedda Hammer at The Great Wall of China, 1941. Photograph reproduced courtesy of Alastair Morrison. Hedda Hammer Morrison's photographs contribute to the images taken by professional and amateur photographers in the period leading up to the establishment of the People's Republic of China, a remarkable archive that documents a changing China. Images taken by non-Chinese photographers are often regarded as self-conscious constructions, created through the choice and presentation of subject matter and primarily intended for a Western audience. Over the past sixty years, however, the archives of non-Chinese photographers have become more significant than the photographers themselves could have envisaged, as part of the historical record. 'China's most famous ruin' in Claire Roberts and Geremie R. Barmé, eds, The Great Wall of China, Sydney: Powerhouse Publishing (with the China Heritage Project, ANU College of Asia & the Pacific), 2006, pp.16-25. 'Hedda Morrison's Jehol', East Asian History, No. 22 (December 2001), pp.1-128. In her view: the photographs of Hedda Morrison in China and Sarawak 1933-67, Sydney: Powerhouse Publishing, Sydney, 1993. 'In her view: Hedda Morrison's photographs of Peking, 1933-46', East Asian History, no. 4 (December 1992), pp.81-104.